The patio at Hay Merchant. Photo by Julie Soefer Photography. Just in time to cheer on the Rockets in the conference semifinals, The Hay Merchant reopens today at 1100 Westheimer after closing temporarily for a few weeks for improvements to its beer cooler. 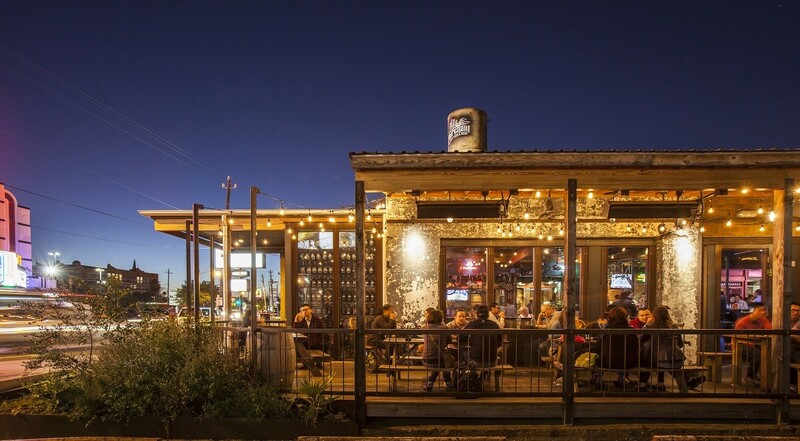 The closing was timed alongside neighboring restaurant Underbelly’s, which will reopen as chef Chris Shepherd’s steakhouse, Georgia James. 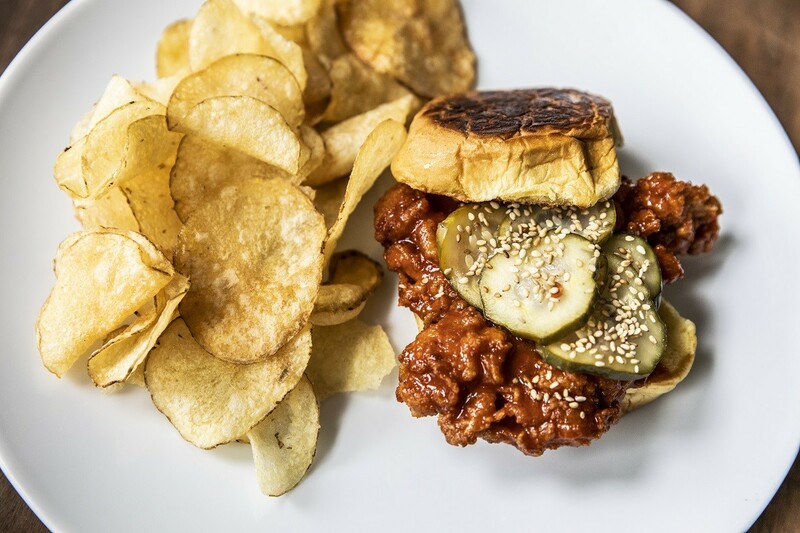 Shepherd, along with The Hay Merchant co-owner Kevin Floyd, took the break as an opportunity to shake up the menu, adding new dishes and more meal times. Underbelly historically drew a good lunch crowd, so The Hay Merchant is now filling the gap by offering lunch service and more dishes. 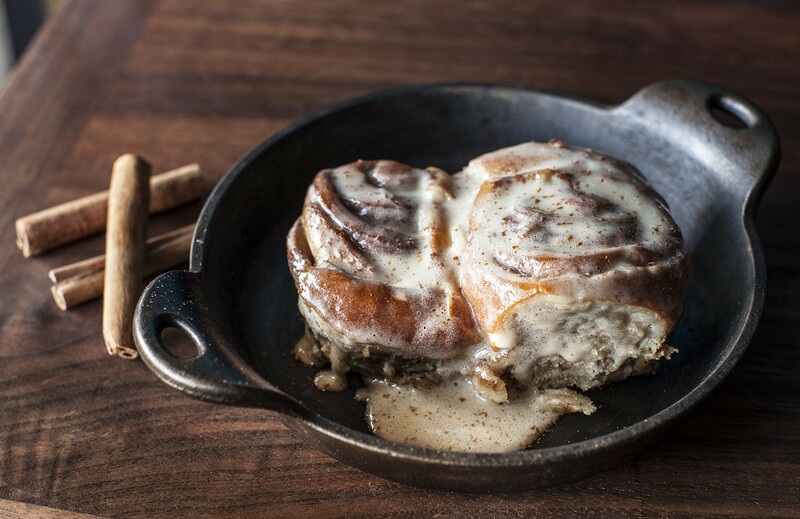 The doors open daily at 11 a.m. and close at midnight, except for Thursdays through Saturdays when hours are extended until 2 a.m.
Victoria’s Cinnamon Rolls with Saint Arnolds Amber glaze is on The Hay Merchant’s new brunch menu. Photo by Julie Soefer Photography. As was the case before, The Hay Merchant opens earlier on the weekends but now offers proper brunch dishes from 11 a.m. to 3 p.m. Those include Bananas Foster Pancakes, “Eggs Benedict-ish,” or poached eggs and sausage patties on a biscuit with cheddar cheese sauce, and Victoria’s Cinnamon Roll with Saint Arnold Amber sugar glaze. The Hay Merchant has also become the home for some Underbelly classics. The Korean Braised Goat and Dumplings, Vietnamese Cha Ca-style catfish and crispy vegetables with caramelized fish sauce will live on. The most popular The Hay Merchant classics are staying, too. (The PB&J wings and crispy pig ears alone are enticing enough to make a long drive in from the suburbs worth it.) Hay Merchant veterans will welcome back the chili cheese fries that were on the menu when the bar initially opened back in 2011. When Hay Merchant initially opened, Kevin Floyd was talking to everyone who would listen about the meticulously designed beer cooler. Floyd designed the cooler with separate zones for lagers and ales, as well as individually regulated pressure valves on each tap, which guaranteed that beer would arrive at the perfect temperature and with the appropriate liquid-to-head ratio. Hundreds of thousands of beers have been poured since 2011, so it was time for the cooler to have a complete restoration. It’s now again ready to be put back to work. Hay Merchant has 75 taps for draft beer and five cask engines for unfiltered and unpasteurized cask ales. 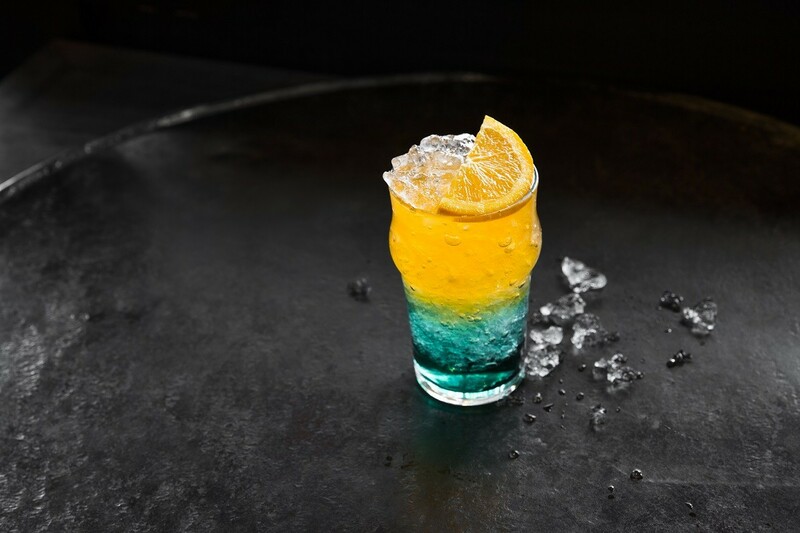 The cocktail program developed by spirits director Westin Galleymore that was launched last September remains, including the Fighting the Bees cocktail. It’s a riff on the traditional Bee’s Knees, which used gin as the base spirit. Fighting the Bees is made of honeysuckle vodka, lemon and lavender honey. The H-Town Slammer (pictured below) is another Instagram-worthy crowd pleaser. The house SoCo-based H-Town Slammer. Photo by Julie Soefer Photography. Evening specials haven’t gone anywhere either. Diners can still enjoy TV Dinner Mondays, Steak Night Tuesdays, Sticky Rib Thursdays and Fried Chicken Sundays with each special available for only $15 until sold out. So head over to Hay Merchant and cheer on the Rockets—after all, when they’re in the lead, all Houston drafts are half off! It looks like Astros fans that play hooky for those pesky Thursday afternoon games just picked up another solid option as well. Great write up and headed in the direction I like!! Thanks Lance, glad you enjoyed the article!